And that’s how I ended up cooking the recipe, exactly as written. 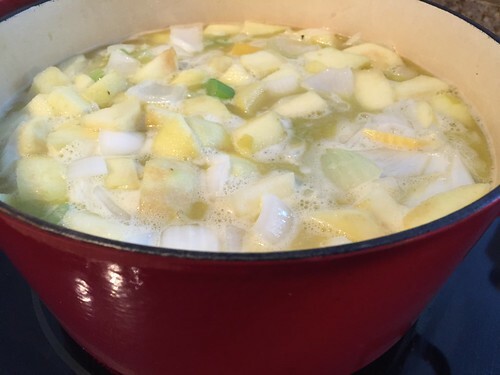 Two Fuji apples joined a mountain of onions, a couple of stalks of celery, and chunks of the root vegetable we call apio, which translates to celery. … then what is that knobby vegetable I’ve been calling apio most of my adult life? I spent over an hour poring over images of edible apiaceae, the scientific name for all edible celery related plants. The anxious look in my face after every scroll and click asked “are you my mother apio?” Turns out the closest relative or approximation to the knobby, yellow root is South American arracacha. The ancestors of the Tainos, the native Puerto Ricans and Dominicans back in the fourteenth century, emigrated from northern South America. It makes sense they brought seeds with them. Most of the countries in the Caribbean basin still call this root apio or cepa de apio, making it easier to find kindred spirits trying to figure out which one is the right tuber. 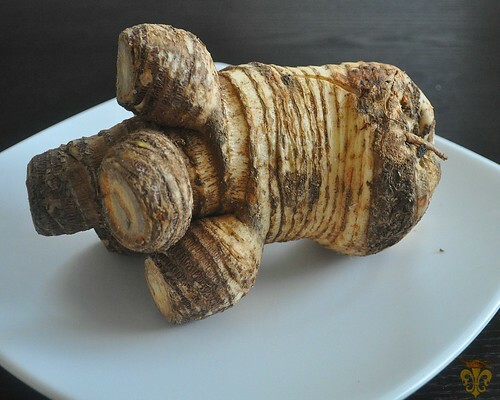 Or in my case, the identity of our weird but delicious celery root. Back to our regularly scheduled programming – aka, the celery-celery soup. 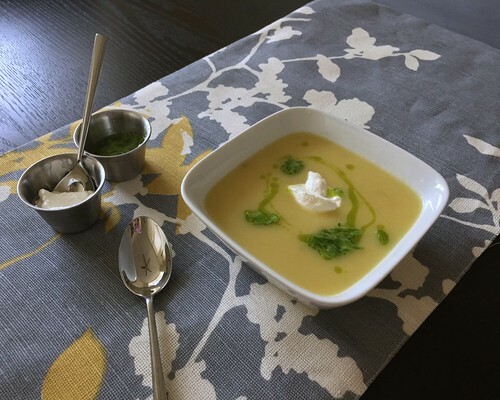 I served the soup the day on the first day with the lazy person’s green onion coulis (basically green onions pureed with olive oil), sour cream, and hot sauce. We had the leftovers with open faced pot roast sandwiches. I have to admit I wasn’t crazy about this one. Between the apples and the creamy, yellow tubers I felt I was eating warm applesauce. That’s not necessarily a bad thing… I just would have enjoyed a savory soup more. One more off the list, though! French Fridays with Dorie is an online cooking group celebrating four years of cooking and talking our way through Dorie Greenspan’s Around My French Table. 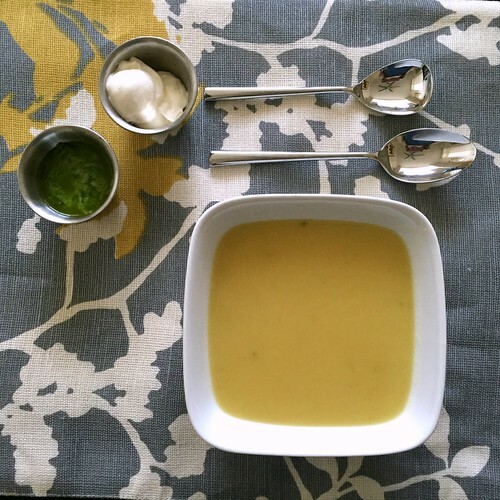 To see what everyone else thought about the Celery Celery Soup, click here! Sorry that you did not enjoy this… your photos of the two tubers are amazing information, both of which are not available in my neck of the woods! ;( But parsnip worked wonders in my soup, delish! Those are my everyday cereal bowls, Nana. Pier 1 open stock from six or seven years ago. this one! It’s been cold and damp here, so it was nice to sit down to a bowl of hot soup! Happy Dorista Anniversary!! A highlight for me was meeting you and our fellow Doristas in Seattle! I made the Friday this week too – barely. Wikimedia Commons is my friend when I need ‘stock’ pictures. 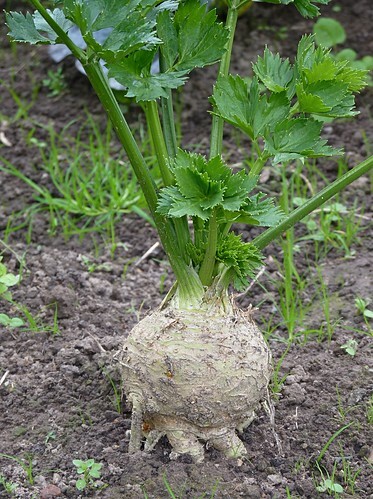 That celeriac picture was a great find. That is one ugly root. I ended up liking it a lot, so I’m sorry to hear you didn’t enjoy the soup. On to the next recipe. We’re in the home stretch. Aw that’s too bad 🙁 The celery root Dorie is referring to is, indeed, celeriac (not the yellow root). Maybe make it with that if you can find it sometime – it is more earthy and cut the sweetness of the apples nicely! I think parsnips would work here too! It is so great to have you back here with us, Adriana, and I appreciate the historical information about the celeriac. I must agree with Mardi that your apio is probably not derived directly from celery root. My nature study group, five of us who are volunteer forest rangers, are actually using Deborah Madison’s Vegetable Literacy cookbook to source plants and learn more about them. So, your Post will be something I’ll share with all of them and get back to you. Thanks for your nice e-mail. My kids have been here visiting for a week so I’m tardy with my responses but hope to catch up this week. Again, glad to see your presence on the FFWD Link. It wasn’t my favorite either. You got such a beautiful texture really terrific looking. How interesting to hear of your different roots in PR! That was fun. And I have to say, your garnish is beautiful – I would never have thought of it, it sounds delicious, and I’m sure improved your soup. This wasn’t my favorite, but with the slightly spicy flavor from the celery root, it was pretty tasty. Sorry you weren’t crazy about this one. Warm applesauce is a good characterization. Thanks for the little history lesson, I enjoyed it. We’ve ALL missed you!!! So glad to see you post…even though this needed a bit of spicing up at your house. Bill wouldn’t even touch it…LOL. Can you believe we’ve been at this for four years, now? I love that you researched the apio – that’s what I would have done, too. It’s too bad the apio wasn’t a good substitution for the celeriac. I thought it was a nice soup with just a hint of sweetness. I wasn’t crazy about this soup either – but it was good. Aren’t celery root/celeriac ugly? 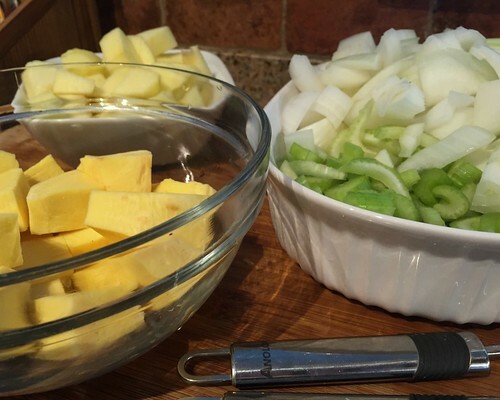 Glad you are back cooking along – I was thinking of you the other day, I had a hankering for some tostones and wondered how Adriana would make them.